The new SE5000 DSP+ is a high performance stereo encoder with Digital Signal Processor (DSP). It replaces our popular SE4000+ and brings new enhanced performance. Built-in compressor, precise LED limiter and balanced inputs, sharp 19KHz stereo carrier notch filter, pre-emphasis, improved channel separation and sharp filters all help to bring out really crisp sound; all coutesy of our DSP audio processor. SE5000 DSP+ can even be upgraded to RDS functionality simply by plugging-in a RDS daughter board. It is perfect for a demanding, but cost-conscious broadcaster. SE5000 DSP+ will make sure your signal stays where you want it, providing high quality audio with excellent channel separation without causing interference to nearby channels. High quality components and printed circuit board assure 24/7 operation for years. Why is SE5000 DSP + so great? - DSP technology enables extremely sharp filters and a very deep notch at 19KHz! 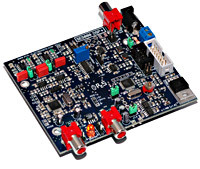 - Drop-in replacement for SE3, SE4 and SE4000 DSP+! - Works with or without LCD control module! - Balanced or unbalanced audio inputs. This effectively eliminates annoying ground loops and hum. - LC filtered MPX output signal. - Built-in limiter, low pass filter and true compressor, all controlled via backlit LCD display and keys. - You can control the sound parameters from the FM exciter’s LCD display unit! How is SE5000 DSP+ better than SE4000 DSP+? - I2C connector was redesigned for standard flat cable, now installation does not require any soldering but merely plugging a 6-pin flat cable into LCD module and stereo encoder. - A number of small improvements that bring out better sound! Can I upgrade my CyberMaxFM transmitter (model D) with new stereo encoder?